Are you as excited as the rest of the movie nerds about the DVD release of The Avengers next week? 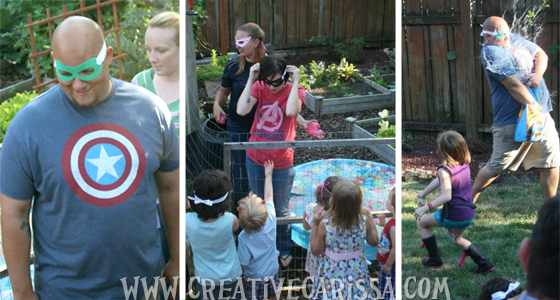 My son and I were invited to a birthday party for a Captain America loving four year old recently and what better time to tell you about this awesome party than right before the DVD release? 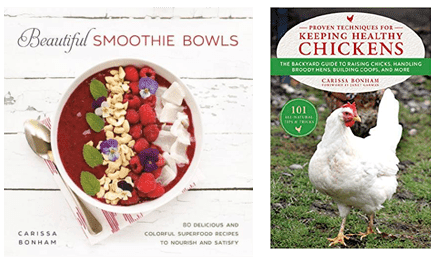 Of course, if you are really excited, you could duplicate a lot of these ideas for a great DVD launch party - no birthday necessary! Hi, Bailey! 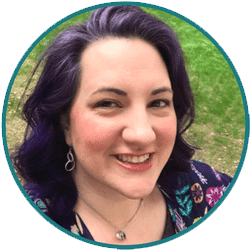 Bailey has mad crafting and cupcaking skills and is too busy being super talented to have a blog but she did give me permission to show off her great party to you guys! 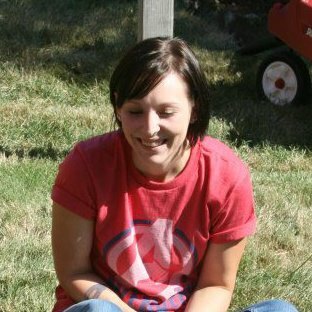 The party was held in her in-law's backyard. 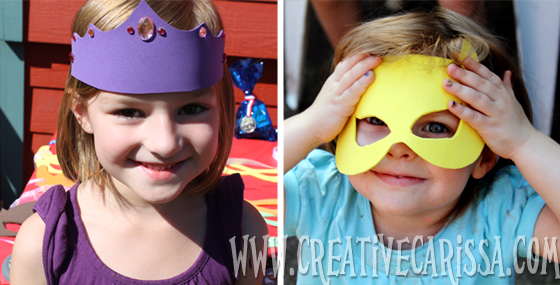 When we first arrived, we were greeted by a table full of super hero crowns and masks so the kids could dress the part to be their super selves. We played four different games. The thing that is genius about these isn't just that the kids LOVED them but that they were easilly adapted for kids of all ages to play together. This party had kids ranging from 2-10 and they all loved the games and played well together. 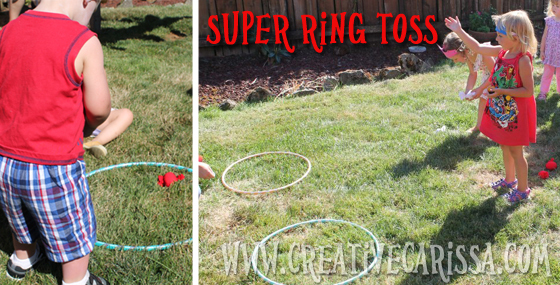 For this game, two hula hoops served as targets and kids threw balls made from left over t-shirt material and dried beans. Easy peasy and inexpensive. How far away the kids stood depended on how old they were. "Kryptonite" was made out of crumpled balls of foil that had been painted green. Kryptonite had been spread throughout the yard and kids had to use shovels to pick up the kryptonite and put it in their team's bucket. This game wasn't just a blast for the kids to play but for the grown ups to watch, too. Max' dad dressed up like a "super villain" (left). Kids were handed water balloons (in the pool in the middle pic) and had to chase the villain around the yard. When they hit him (right), he would toss candy and prizes out the bag we was carrying. Kind of like a piñata. But way more fun and with some more skill involved. For this game, a variety of plastic super hero action figures had been frozen into blocks of ice. 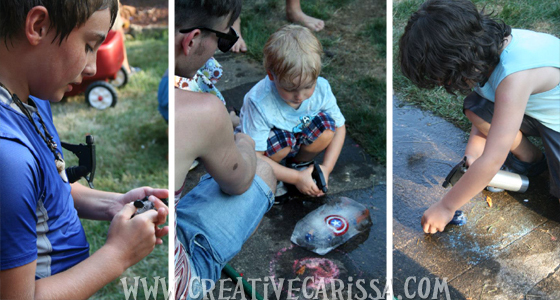 In order to free the superhero and claim their prize, kids had to spray the ice blocks with spray bottles to melt the ice and rescue them. The birthday boy (center) even had a full size Captain America figure as one of his birthday gifts....but he had to work for it! This game was my son's favorite and he will tell anyone who will listen about his superhero who had to be rescued out of the ice. 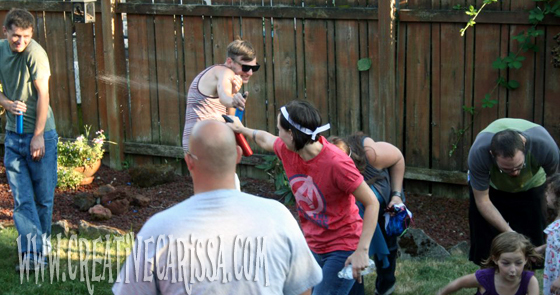 Of course when the kids were done rescuing the superheroes the adults took over and had a water bottle fight! 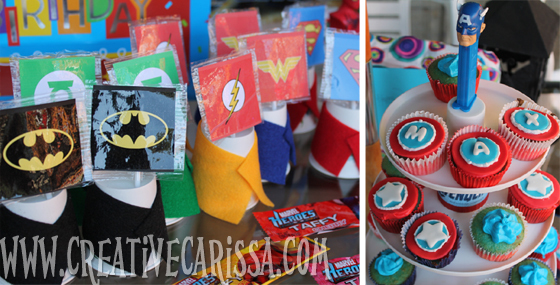 There was a variety of superhero fuel (AKA snacks) set up on the table. 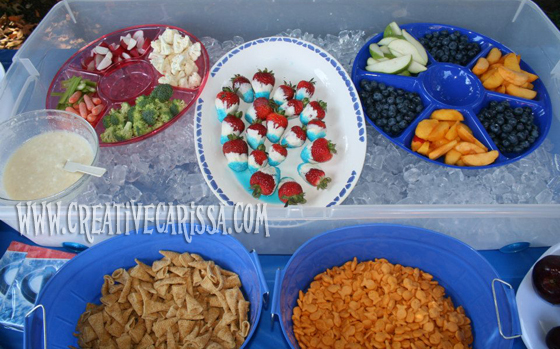 Bailey used red and blue plates and buckets from the dollar store to hold snacks. Also check out those fabulous red white and blue strawberries that were dipped in white chocolate and sprinkled with blue sugar! The cake table also served as the gift table and a place for some more favors. 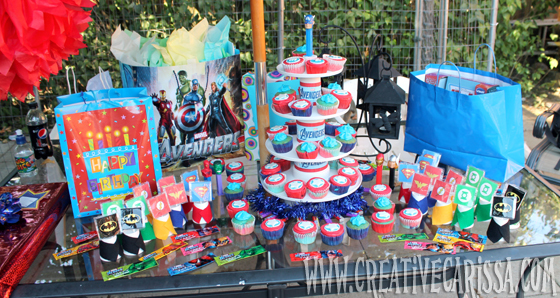 Right: A tower of superhero cakes topped with a Captain America pez dispenser. Bailey used fondant to make star badges and to spell out the birthday boy's name at the top of the tower. The cupcakes were red, white and blue. My favorite ones had blueberries in the bottom. You think the birthday boy liked it? You betcha! Look at that excited little face!! Thanks for letting me show off this great party. Hopefully you found something to inspire your future Avengers or Superhero celebrations. 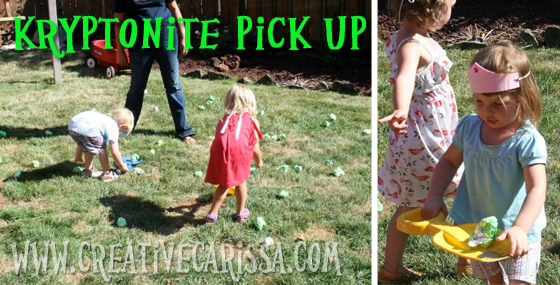 I just love your party game ideas, thanks for sharing I will definitely be using a few if not all. AWESOME PARTY IDEAS! WHERE I'M HAVING THE PARTY NO ROOM FOR JUMPER SO I REALLY NEEDED IDEAS ON WHAT TO DO WITH ALL THE LITTLE SUPERHEROS...THANKS! 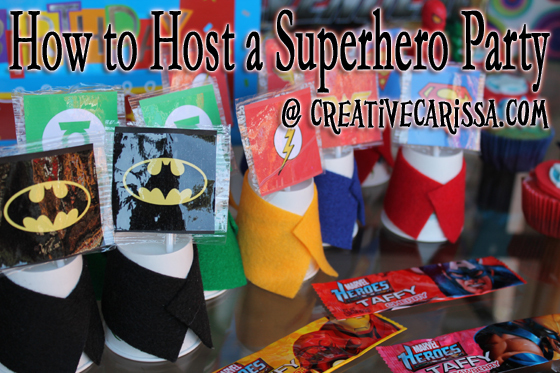 Found this link on Pinterest, my daughter has requested a superhero party this year. These are all great ideas, I will definitely be pinning this page!